To show just how healthy the funding market is when it comes to small businesses accessing capital, Enterprise Nation is putting on an event ‘Show me the money!” where over 20 funders will showcase their offer. We’re delighted to be one of them! Access to funding still appears too often on the list of challenges claimed to be affecting small businesses. Admittedly I meet small businesses every day who are on the look-out for funds but I just as regularly meet quality funders who have assets to lend and the inclination to support ambitious entrepreneurs. The challenge, I’ve concluded, is that the two groups just don’t meet enough! Three entrepreneurs who have, between them, successfully raised millions, will offer their top tips. But this event is for any business owner, whether you’re looking for £1,500 or £1.5 million. I hope to see deals done on the night – and to see you there! 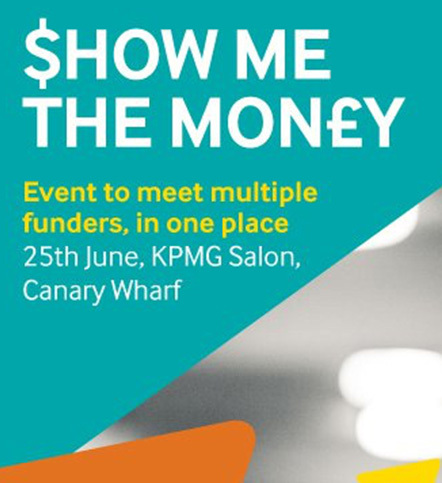 ‘Show me the Money!’ will be hosted on 25 June at KPMG Winter Garden, Canary Wharf. It’s free for Enterprise Nation members to attend and £10 for non-members. Sign up at: Show me the Money!